The source code of this example can be found under "Examples\Basics\" subfolder of the MVC# framework root folder. The framework itself can be downloaded from www.MVCSharp.org/download.aspx. Architectural patterns such as Model-View-Controller are gaining more and more popularity nowdays. The reason is simple: they improve applications' design and raise their maintainability by splitting applications into three layers with distinct responsibilities. However incorporating such patterns into an application requires some effort - the fact that may discourage developers from using MVC and similar approaches. Fortunately a number of frameworks exist, which minimize the overhead of using architectural patterns such as MVC. One of such frameworks is MVC#. It assists developers in using the Model-View-Presenter pattern (an evolution of MVC) by taking on itself all routine work, allowing to develop 3-tier MVP applications with ease. In this article we will demonstrate how to build a Model-View-Presenter application with the help of MVC# Framework. Our first example application will be intended for managing customers and their orders. It will consist of two views: first one displays customers and has a button to switch to the second view. 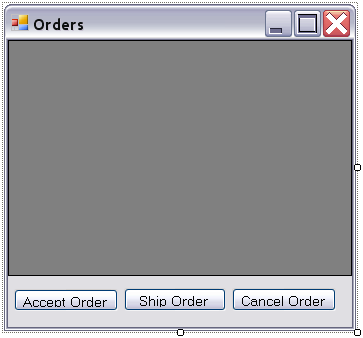 The second view lists orders for the selected customer and has buttons to operate on the order selected: “Accept”, “Cancel” and “Ship”. We will implement views for Windows, Web and Silverlight presentation platforms, revealing how MVC# allows to target the same application to different presentation mechanisms. Before reading the article be sure to get acquainted with the Model-View-Presenter essentials. A gentle introduction to MVP and MVC can be found here. Also note that the code listings throughout the article may omit minor details for simplicity sake. For exact code see the example sources. Firstly we are going to create the model part of the MVP triad. It will consist of two classes: Customer and Order. While the Customer class just holds a list of orders and a static list of all customers, the Order is a little more complicated having three operations. Every MVC# application consists of one or more tasks. A task is an independent set of actions which accomplish some job, typically representing a use case for the system. Tasks may be "Book ticket", "Calculate taxes" and others. In our example application there will be a single task for managing customers and their orders. Each task consists of a number of views which a user traverses to complete the task. Our example task will have two views: "Customers" and "Orders". In order to describe a task we should declare its class. For each view a public constant field, initialized with the view name, should be added to the task class. According to the Model-View-Presenter pattern a view is never alone, it always exists in pair with its controller (the view-controller pair is referred to as interaction point), that is why for each view we also specify its controller type with the [InteractionPoint] attribute. 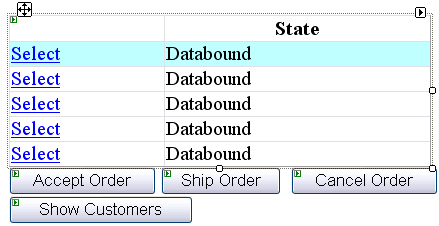 Besides the controller type, [InteractionPoint] attribute specifies permitted navigation targets. Thus above we have stated both Customers->Orders and Orders->Customers transitions possible. In MVC# all tasks should implement the ITask interface. Though this interface is rather simple and can be implemented manually, the MVC# framework already comes with a basic implementation TaskBase. We will use it as a base for our MainTask class. NavigateDirectly method activates a view regardless of the current view (which is null at the beginning) and of possible navigation routes. Now we are ready to deal with the rest of the application logic placed in the controller classes. Let us start with the CustomersController class. Note that controllers in MVC# should conform to the IController interface. But as it is with the ITask interface MVC# provides a common IController implementation ControllerBase which we are using. In the above code we first subscribe to the MainTask.CurrentCustomerChanged event as soon as the controller is linked to the task object. Then we just handle the customer change event by passing the corresponding orders to the view. The presentation layer consists of view classes. All views in MVC# should implement the IView interface. In addition view classes should conform to particular interfaces dictated by the application logic layer. In our example such interfaces are ICustomersView and IOrdersView. Depending on the presentation platform chosen, view classes should inherit an appropriate base view class (either Windows form, or Web form, or Silverlight user control). We will design views for all three platforms supported at the moment (Windows, Web and Silverlight) and will start with Windows form views. 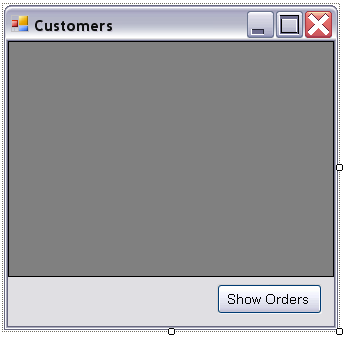 First let us create the customers view for the Windows Forms presentation mechanism. As mentioned above it should be a subclass of the Windows Form class and should implement the IView interface. To reduce the amount of manual work we will make it inherit from the WinFormView class - a simple Form subclass implementing the IView interface. 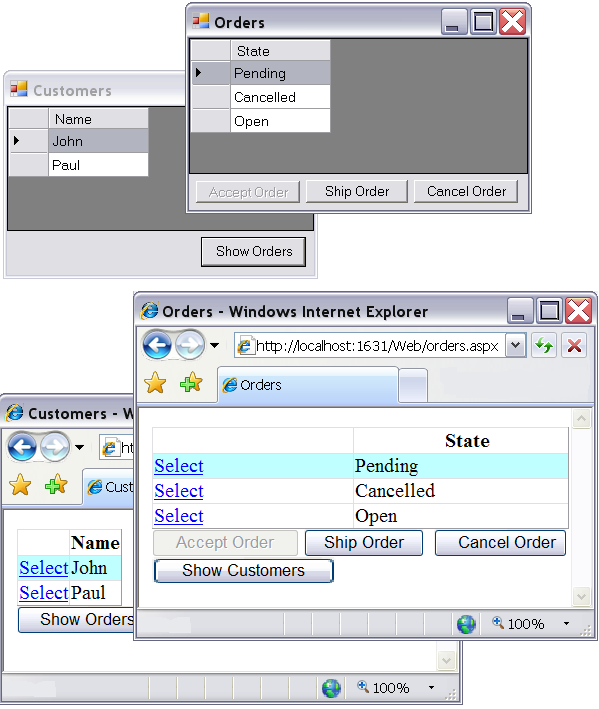 In the same manner as it was with the CustomersView, the OrdersView class should inherit from the WinFormView class and implement the IOrdersView interface for the framework and the controller to interact with it. It should also have a [View] attribute to indicate its belonging to the main task as the "Orders" view. 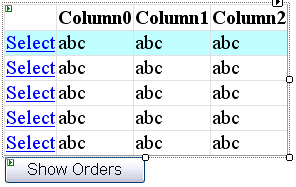 <Button Width="75" Height="25" HorizontalAlignment="Right" Grid.Row="1"
Note that for binding the view class to the task we are using the [View] attribute, like we did for the Windows Forms platform. And again, we omit the description of the steps here, as everything is similar to what we have done already. If necessary, see the example sources. Every MVC# application requires some configuration steps. All configuration data is encapsulated in MVCConfiguration class instances. However instead of manually setting up MVCConfiguration objects it is possible to obtain preconfigured instances by the view managers' GetDefaultConfig() static method. After the configuration is done it is time to start the task by passing its type to the TasksManager.StartTask(...) method. TasksManager tasksManager = new TasksManager(WinformsViewsManager. TasksManager tm = new TasksManager(WebformsViewsManager. TasksManager tasksManager = new TasksManager(SilverlightViewsManager. This example gives the general look on how to construct layered applications with MVC# framework. It demonstrates the common idea of the Model-View-Presenter approch - that is breaking an application into three layers: one for business objects (model), another for application logic (controllers), and the last for presentation (views). And it shows how MVC# simplifies implementing the MVP approach in your applications.